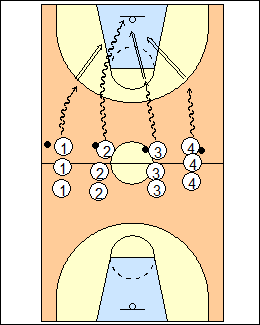 A fun drill at the start or end of practice. 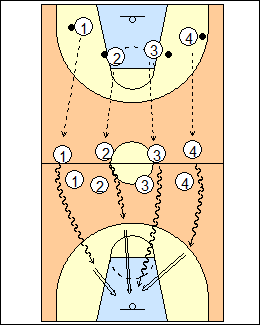 Each team has one ball, the first player dribbles towards the basket and can shoot from behind the arc for 3 points on a make, inside the arc but outside the lane for 2 points, or a layup for 1 point. Each shooter rebounds and passes to a teammate, who dribbles to the far basket and has the same choice of shots. The pass must be made in the backcourt (no leaking early) or else dribble into the backcourt, optionally deduct a point. Shooters will follow their passes back to halfcourt. First team to 31 wins. See Shooting - Choice is yours, Dribble shoot relay, Move, Layups - DeMatha speed.